Contest is Closed, Thanks to everyone who has entered. Congrats to nICK rIVIERA!!! BCCHardware and Crucial are proud to bring you the October RAM Fest! This month's contest is for 2GB of Crucial Ballistix Tracer PC2-6400 ***. This is some pretty slick RAM that runs fast, and ads some serious bling to your PC. This contest is for Canadians only - in response to the USA only "Talk like a Pirate" contest hosted by Crucial last month. We asked them if they'd sponsor a contest for my fellow Canadians and they have come through. To enter you must find a Crucial emblazoned BCCHardware case. Contest ends October 31, 2007 @ 11:59pm. Winner will be drawn randomly and announced shortly thereafter. Crucial will cover shipping anywhere in Canada. Go Canadians, start hunting for the logo and enter to win free RAM. To make it even easier, this is what you're looking for! 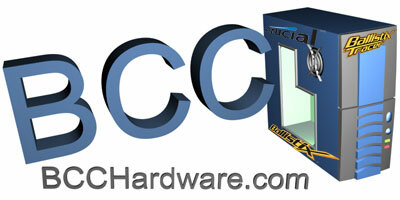 *** If requested Crucial will ship the winner DDR if they have an older system in place of DDR2.